This kit provides all the things you need to create a very personal Greeting card for that special person - except the yarn. It has a small weaving frame and aperture card with envelope plus instructions are all included. 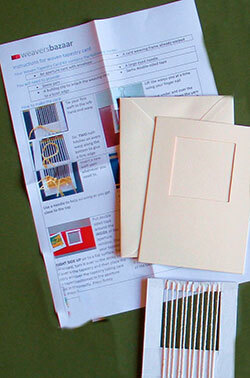 Below is an example of the sort of weaving you can achieve with this card kit. If you would like to buy some yarn as well, you will find it here.